A dazzling orchestral disc of music from the Jewish tradition of the late-nineteenth and early-twentieth centuries. 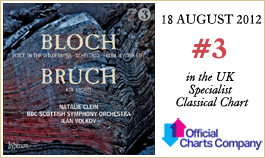 Bruch’s Kol Nidrei is one of the most well-loved works in the cello repertoire. The descending opening phrase of the cello line is instantly recognizable: a universal, extraordinarily expressive utterance. The main part of the disc comprises the works for cello and orchestra by Ernest Bloch, all part of his ‘Jewish cycle’. The most famous is Schelomo, a work inspired by passages from Ecclesiastes, where the cello, playing a deeply lyric and speaking line of prodigious technical difficulty, can be seen as ‘the incarnation of King Solomon’, as Bloch himself wrote. The other large-scale work for cello and orchestra, Voice in the Wilderness, is of a darker hue. Both works reveal a composer whose works should be firmly in the canon of twentieth-century symphonic writing. The cellist here is Natalie Clein, a celebrated figure in British musical life since winning BBC Young Musician of the Year in 1995 and now a formidable artist, possessed of great musical, technical and intellectual gifts. 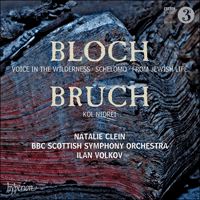 Each of the three ‘Jewish’ works by Ernest Bloch on this recording was written during a different biographical and musical phase of the composer’s life. Schelomo was completed in Geneva when he was at the height of his ‘Jewish Cycle’ (six epic works dating from 1912 to 1916, plus an unfinished opera, Jézabel). From Jewish Life came nearly a decade later, when he was focusing mainly upon writing chamber music and teaching at the Cleveland Institute of Music (which he had founded in 1920). Voice in the Wilderness was composed just over a decade after that, when Bloch had temporarily returned to Europe (1930–38) and was again devoting himself exclusively to composition, while living in the mountains near Geneva. Schelomo, subtitled ‘Rhapsodie hébraïque’, was written in the space of six weeks during January and February 1916. Bloch had, over a number of years, noted down thematic ideas for a vocal setting of selected verses from the biblical book of Ecclesiastes, the authorship of which is attributed to King Solomon (Hebrew: Schelomo) who reigned some 3000 years ago. Bloch had felt, however, that French, German or English were somehow unsuitable for the purpose, and that his grasp of Hebrew was inadequate. Coming into contact with the celebrated Russian cellist Alexandre Barjansky (1883–1961) and his wife Katja in Geneva towards the end of 1915 (some six years after their first meeting), Bloch was keen to share with them his ‘Jewish Cycle’ in general, and this new work in particular. Barjansky was greatly moved by what he heard. Realizing that the cello was the solution to the language problem, Bloch reformulated his sketches and passed them to Alexandre for scrutiny, while Katja at the same time made a small sculpture of King Solomon. In gratitude, Bloch dedicated Schelomo to the Barjanskys. According to Bloch: ‘It is possible to imagine that the solo cello is the incarnation of King Solomon, and that the orchestra represents his internal world and his experience of life, though sometimes it is the orchestra that seems to reflect Solomon’s thoughts, while the solo instrument voices his words: “All is vanity.”’ Bloch places much emphasis on the king’s pessimism, despite ‘the royal pomp, the treasure, the wealth, the power, the women, all that a man might desire in this world’, and ‘the barbaric coloration of an Oriental world’ that surround him. The rhapsodic manner and glittering instrumentation may give the work an improvised air, but the underlying structure is a sturdy ‘ternary’ form (ABA), plus an introduction and coda. The heroic melody that appears before and during the great orchestral climaxes occurring towards the end of the first and third sections of Schelomo is built upon motifs that bear a remarkable resemblance to the those of Tzur Yisroel (‘Rock of Israel’), a traditional chant that Bloch received from Reuben Rinder (1887–1966, Cantor at Temple Emanu-El, San Francisco) in the late 1920s while preparing his Avodath Hakodesh (‘Sacred Service’, 1930–33). Nevertheless, although numerous motifs throughout the six published works of the ‘Jewish Cycle’ are the composer’s subconscious transformations of biblical and cantorial chant, in only one instance did Bloch acknowledge that he had consciously taken a melody from a traditional source—a motif that his father ‘sang often, in Hebrew’, which appears for the first time at the beginning of the middle section of Schelomo. Bloch quoted the Hebrew text in a letter written to his mother four years after the work had been completed; and the melody is, in fact, an adaptation of a South German cantorial chant Uv’chen ten pachdecha, sung in Ashkenazi synagogues during High Holy Days. Despite the enormously demanding technical skills required of the soloist, this is not a concerto in the usual sense, and virtuosity is always the servant of that expressiveness in which the spiritual and sensual are fused. The work was originally conceived for the piano—and indeed there is a separate version for piano solo, entitled Visions et Prophéties (comprising five of the six movements), which Bloch composed subsequently. But at this early stage the composer found himself constantly singing counterpoints while playing through the work. Despite suffering from poor health at the time, Bloch persevered with its construction and decided to add a cello part. Although it was still incomplete, Bloch, with Alexandre Barjansky who was visiting him in June 1935 in Paris (where he was living temporarily), played sections of it to Edmond Fleg (1874–1963)—librettist for Bloch’s operas Macbeth and Jézabel, and three Psalm settings. The great enthusiasm with which it was greeted encouraged Bloch to finish the cello-and-piano version by mid-August 1935, and the cello-and-orchestra version in late January 1936. The process of finding a suitable title was arduous. Bloch had sent his friend Carl Engel a detailed analysis of his composition including indications as to the fluctuations of mood and atmosphere within each movement. Engel recalls that, during his subsequent visit to Bloch (now domiciled in Châtel, Haute-Savoie), he was deeply moved by the religious fervour and prophetic eloquence of Bloch’s performance on the piano; and the image of a ‘Voice in the Wilderness’ came spontaneously into his mind. Without hesitation, the composer wrote these words on the first page of his manuscript since, for him, this title perfectly evoked the journey of the soul through the whole spectrum of life’s experience. Each of the six short movements has, in principle, the same bipartite structure: the first section, purely orchestral, is where the thematic material is presented; the second is where the solo cello enters, to orchestral accompaniment, and reflects melodically and rhythmically upon the mood and ethos of what has come just before. Any description of mood is bound to be subjective, especially since no specific ‘programme’ per se was intended by Bloch. But the following indicators might give a general impression of the emotional world depicted in each movement. The first expresses a grave and solemn sentiment, and the second reveals touches of bitterness; the third is more energetic and extrovert in character, whereas the fourth enters an idyllic dream-like dimension; the fifth, like the third, is more lively and forceful, and ends with a passionate and highly chromatic cadenza for solo cello; and the sixth, the longest of all, radiates joy, confidence, hope, and ‘the victory of the spirit’, concluding with a diatonic melody redolent of purification and peace. All the movements follow each other without a break—except for a brief pause between the last two. Unity is ensured by the use of ‘cyclic’ form, where themes presented in earlier movements recur, sometimes identically and sometimes in different guises, in later movements. This is a feature common to many of Bloch’s works. Although there are no conscious quotations from the traditional melodic repertoire, the fingerprints of Bloch’s ‘Jewish’ style are ubiquitous: the use of traditional Ashkenazi and Middle Eastern modal resonances in general, and the frequent appearance of the augmented-second interval (often with semitones on either side) in particular; bare parallel fourths or fifths; dotted and ‘Scotch snap’ rhythms; frequent changes of tempo and metre; dynamic extremes; vivid contrasts of intensity and calm—sometimes gradual, sometimes abrupt. Musical affinities with earlier compositions such as Trois Poèmes juifs (1913), the three Psalms, 137, 114, 22 (1912–14), Israel Symphony (1915–16), Schelomo (1916), String Quartet No 1 (1916), Baal Shem Suite (1923), and the ‘Sacred Service’ (1930–33)—as well as anticipations of future works such the Violin Concerto (1938) and Suite hébraïque (1951)—may be found here in abundance. Max Bruch’s Kol Nidrei, Op 47, was written in Berlin in 1881 and dedicated to the cellist Robert Hausmann (1852–1909). It comprises two entirely separate musical entities. The first part is based upon a German synagogue chant, probably originating in the early sixteenth century, which has since become the universally accepted Ashkenazi setting of this eleventh-century Aramaic text. While living in Berlin, Bruch had learned one of the numerous variants of this melody from Cantor Abraham Lichtenstein (1806–1880), similar to the one that Louis Lewandowski (1821–1894) included in his two synagogue anthologies: Kol Rinnah U’t’fillah and Todah W’simrah. The second part is based upon the middle section of the song ‘O weep for those that wept by Babel’s stream’ (a paraphrase of Psalm 137) by the Anglo-Jewish composer Isaac Nathan (1790–1864), one of over thirty settings of texts that comprise Hebrew Melodies by Lord Byron (1788–1824), dating from 1815–16. The intense drama of the first part of Bruch’s Kol Nidrei, in the minor key, is counterbalanced by the overarching lyricism of the second section in the major. The composer speculated that it was primarily the enormous popularity of this work that accounted for assumptions regarding his Jewish identity. However, his earliest known ancestor was Thomas Bruch (born 1560)—the first in a long line of Christian clerics. The passion of the ‘cellist as cantor’ performing a melody that has become iconic over the centuries evokes a mood of religious devotion in those who hear it as a profoundly liturgical expression. For those who are inspired by the beauty of secular art music, it creates an atmosphere of deep meditation and repose. Ernest Bloch rédigea chacune des trois œuvres «juives» réunies ici à une étape différente de sa vie et de sa musique. Schelomo remonte à sa période genevoise, alors qu’il était au summum de son «Cycle juif» (six œuvres épiques datant de 1912 à 1916, plus l’opéra inachevé Jézabel). Au moment de From Jewish Life, presque dix ans plus tard, il s’attachait surtout à écrire de la musique de chambre tout en enseignant au Cleveland Institute of Music (qu’il avait fondé en 1920). À peine dix ans plus tard encore, Voice in the Wilderness coïncida avec son retour temporaire en Europe (1930–1938), dans les montagnes proches de Genève, où il se consacrait de nouveau à la composition. Schelomo, sous-titrée «Rhapsodie hébraïque», fut écrite en six semaines, en janvier–février 1916. Depuis plusieurs années, Bloch consignait des idées thématiques pour une mise en musique vocale d’un choix de versets tirés de l’Ecclésiaste, dont la paternité est attribuée au roi Salomon (Schelomo en hébreu), qui régna voilà quelque trois mille ans. Vers la fin de 1915, sentant que ni le français, ni l’anglais, ni l’allemand ne se prêtaient à cet exercice, et que sa connaissance de l’hébreu était insuffisante, Bloch contacta à Genève un couple rencontré six ans auparavant, le célèbre violoncelliste russe Alexandre Barjansky (1883–1961) et sa femme Katja, avec lesquels il tint à partager son «Cycle juif» en général, et cette nouvelle œuvre en particulier. Barjansky fut bouleversé par ce qu’il entendit. Quand il comprit que le violoncelle était la solution à son problème de langue, Bloch reformula ses esquisses et demanda à Alexandre de les examiner. Katja, de son côté, réalisa une petite sculpture du roi Salomon. En gage de gratitude, Bloch leur dédia Schelomo. «On peut imaginer, explique Bloch, que le violoncelle solo est l’incarnation du roi Salomon, et que l’orchestre symbolise son univers intime et son expérience de la vie, encore que ce soit parfois l’orchestre qui semble refléter ses pensées, tandis que l’instrument solo énonce ses paroles: “Tout est vanité.”» Bloch insiste beaucoup sur le pessimisme de ce roi qu’entourent pourtant «la pompe royale, le trésor, la richesse, le pouvoir, les femmes, tout ce qu’un homme pourrait désirer en ce monde» et «l’exubérance débridée d’un monde oriental». Même si elle peut paraître improvisée, avec sa manière rhapsodique et son ornementation scintillante, cette œuvre a pour structure sous-jacente une robuste forme ternaire (ABA), assortie d’une introduction et d’une coda. La mélodie héroïque qui survient avant et pendant les grands apogées orchestraux, vers la fin des première et troisième sections de Schelomo, est bâtie de motifs ressemblant beaucoup à ceux de Tzur Yisroel («Rocher d’Israël»), un chant sacré traditionnel que Bloch tenait de Reuben Rinder (1887–1966, chantre à la synagogue Emanu-El de San Francisco) à la fin des années 1920, alors qu’il préparait son Avodath Hakodesh («Service sacré», 1930–1933). Mais, alors même que maints motifs des six œuvres publiées du «Cycle juif» sont des métamorphoses subconscientes du chant biblico-cantoral, Bloch admit un seul emprunt mélodique conscient à une source traditionnelle—un motif que son père «chantait souvent, en hébreu» et qui apparaît pour la première fois au début de la section centrale de Schelomo. Quatre ans après l’avoir intégré dans cette œuvre, Bloch en cita le texte hébreu dans une lettre adressée à sa mère; la mélodie est, en réalité, adaptée d’un chant cantoral d’Allemagne du Sud, Uv’chen ten pachdecha, interprété dans les synagogues ashkénazes pendant les Jours suprêmes. Malgré la considérable maîtrise technique exigée du soliste, il ne s’agit pas là d’un concerto au sens habituel du terme, et la virtuosité est toujours au service de cette expressivité fusionnant spirituel et sensuel. L’œuvre fut originellement conçue pour le piano—de fait, Bloch en donna plus tard une version séparée pour piano solo intitulée Visions et Prophéties (et comptant cinq des six mouvements). Mais à ce premier stade, il se surprit à constamment chanter des contrepoints pendant qu’il jouait sa composition. Malgré sa mauvaise santé, il persévéra dans la même construction et décida d’ajouter une partie de violoncelle. Alors même qu’elle était encore inachevée, il en joua des sections à Edmond Fleg (1874–1963)—le librettiste de ses opéras Macbeth et Jézabel, ainsi que de trois psaumes—, en compagnie d’Alexandre Barjansky, venu le voir en juin 1935 à Paris (où il vivait temporairement). Fort de l’enthousiasme soulevé par son œuvre, Bloch en termina la version pour violoncelle et piano à la mi-août de 1935, et celle pour violoncelle et orchestre à la fin de janvier 1936. Trouver un titre adéquat fut ardu. Bloch avait envoyé à son ami Carl Engel une analyse détaillée de sa composition, y compris les fluctuations de climat et d’atmosphère au sein de chaque mouvement. Engel se rappelle que, lors de sa visite à Bloch (désormais domicilié à Châtel, en Haute-Savoie), il fut profondément ému par la ferveur religieuse et l’éloquence prophétique de son exécution pianistique; et l’image d’une «Voix dans le désert» (Voice in the Wilderness) lui vint spontanément à l’esprit. Sans hésiter, Bloch écrivit ces mots sur la première page de son manuscrit car, pour lui, ils traduisaient parfaitement le voyage accompli par l’âme à travers tout le spectre de l’expérience de la vie. Chacun des six courts mouvements a, en principe, la même structure bipartite: d’abord une section purement orchestrale, où le matériau thématique est présenté; ensuite une section où le violoncelle solo entre, accompagné par l’orchestre, et qui reconsidère, sur le plan mélodico-rythmique, le climat et l’éthos de ce qui vient de se passer. Toute description de climat ne laisse pas d’être subjective, d’autant que Bloch ne conçut aucun «programme» en soi, mais les indicateurs suivants peuvent donner une impression globale de l’univers émotionnel de chaque mouvement. Au sentiment grave et solennel exprimé par le premier succède le soupçon d’amertume du deuxième tandis que le troisième est plus énergique, plus extraverti et que le quatrième entre dans une idyllique dimension onirique; le cinquième, qui est, comme le troisième, plus enjoué, plus énergique, s’achève sur une cadenza fervente et très chromatique, pour le violoncelle solo; quant au sixième, le plus long de tous, il irradie la joie, la confiance, l’espoir et «la victoire de l’esprit» pour s’achever sur une mélodie diatonique sentant la purification et la paix. Tous les mouvements s’enchaînent sans interruption—excepté une courte pause entre les deux derniers. L’unité est garantie par la forme «cyclique», où les thèmes présentés dans les mouvements précédents reviennent dans les mouvements suivants, tantôt à l’identique, tantôt sous des habits différents. C’est là un trait commun à maintes œuvres de Bloch. Si Bloch ne cita pas consciemment le répertoire mélodique traditionnel, les empreintes de son style «juif» sont omniprésentes: l’usage des résonances modales traditionnelles ashkénazes et moyen-orientales, et notamment la fréquente apparition de l’intervalle de seconde augmentée (souvent flanqué de demi-tons); les quartes ou quintes parallèles dépouillées; les rythmes pointés et «lombards»; les nombreux changements de tempo et de mesure; les extrêmes dynamiques; les vifs contrastes d’intensité et de calme—tantôt progressifs, tantôt brutaux. Là abondent les affinités musicales avec certaines de ses compositions antérieures comme Trois Poèmes juifs (1913), les trois psaumes 137, 144 et 22 (1912–1914), la Symphonie Israël (1915–1916), Schelomo (1916), le Quatour à cordes nº 1 (1916), la suite Baal Shem (1923) et le «Service sacré» (1930–1933)—sans oublier les anticipations d’œuvres comme le Concerto pour violon (1938) et la Suite hébraïque (1951). Écrit à Berlin en 1881 et dédié au violoncelliste Robert Hausmann (1852–1909), Kol Nidrei op. 47 de Max Bruch comporte deux entités musicales totalement distinctes. La première partie repose sur un chant synagogal allemand remontant probablement au début du XVIe siècle et devenu, depuis, la mise en musique ashkénaze universellement reconnue de ce texte araméen du XIe siècle. Quand il vivait à Berlin, Bruch avait appris une des nombreuses variantes de cette mélodie auprès du chantre Abraham Lichtenstein (1806–1880), variante similaire à celle que Louis Lewandowski (1821–1894) inclut dans ses deux anthologies synagogales: Kol Rinnah U’t’fillah et Todah W’simrah. La seconde partie se fonde sur la section centrale du chant «O weep for those that wept by Babel’s stream» (une paraphrase du psaume 137) d’Isaac Nathan (1790–1864)—il fait partie de la trentaine de textes que ce compositeur juif anglais mit en musique, dont les Hebrew Melodies de Lord Byron (1788–1824), datées de 1815–1816. Le drame intense de la première partie de ce Kol Nidrei, en mineur, est balancé par le lyrisme dominant de la seconde section, en majeur. Bruch spécula qu’on le supposait juif à cause, surtout, de l’immense popularité de cette œuvre. Mais son plus ancien ancêtre connu était Thomas Bruch (né en 1560), le premier d’une longue lignée d’ecclésiastiques chrétiens. La passion du «violoncelliste-chantre» exécutant une mélodie devenue, avec les siécles, iconique suscite un climat de dévotion religieuse chez ceux qui y perçoivent une expression extrêmement liturgique. Chez ceux qu’inspire la beauté de la musique savante profane, elle fait naître une atmosphère de profonde méditation et de repos. Die drei hier vorliegenden „jüdischen“ Werke von Ernest Bloch entstanden jeweils in unterschiedlichen biographischen und musikalischen Phasen im Leben des Komponisten. Schelomo wurde auf dem Höhepunkt seines „Jüdischen Zyklus“ komponiert (sechs umfangreiche Werke, die zwischen 1912 und 1916 entstanden, sowie eine unvollendete Oper, Jézabel) und in Genf fertiggestellt. From Jewish Life komponierte er fast ein Jahrzehnt später, als er in erster Linie Kammermusik schrieb und am Cleveland Institute of Music (das er 1920 gegründet hatte) lehrte. Voice in the Wilderness wiederum entstand etwas über ein Jahrzehnt später, als Bloch kurzzeitig nach Europa zurückgekehrt war (1930–38), sich wieder ausschließlich dem Komponieren widmete und in den Bergen bei Genf wohnte. Schelomo trägt den Untertitel „Rhapsodie hébraïque“ und wurde innerhalb von sechs Wochen im Januar und Februar 1916 komponiert. Bloch hatte über mehrere Jahre hinweg thematische Skizzen für eine Vokalvertonung verschiedener Verse aus dem alttestamentarischen Buch Kohelet gemacht, dessen Autorschaft König Salomo (im Hebräischen: Schelomo) zugeschrieben wird, der vor etwa 3000 Jahren regierte. Bloch war jedoch der Ansicht, dass das Französische, Deutsche oder auch Englische sich für dieses Vorhaben nicht eignen würden und dass sein Verständnis des Hebräischen unzulänglich sei. Als er mit dem berühmten russischen Cellisten Alexandre Barjansky (1883–1961) und dessen Frau Katja gegen Ende des Jahres 1915 in Genf in Kontakt kam (sie hatten sich etwa sechs Jahre davor kennengelernt), war Bloch geradezu erpicht darauf, ihnen seinen „Jüdischen Zyklus“ und insbesondere dieses neue Werk vorzustellen. Barjansky war von der Musik zutiefst ergriffen. Bloch realisierte dann, dass das Cello die Lösung zu seinem Sprachproblem sein würde, änderte seine Skizzen entsprechend um und gab sie Barjansky zur Durchsicht. Katja Barjansky fertigte zur selben Zeit eine kleine Skulptur von König Salomo an. Als Dank dafür widmete Bloch den Barjanskys sein Werk Schelomo. Bloch erklärte: „Es ist durchaus möglich, sich das Solocello als Verkörperung König Salomos vorzustellen, wobei das Orchester seine innere Welt und seine Lebenserfahrung repräsentiert. Manchmal scheint das Orchester jedoch auch Salomos Gedanken zu reflektieren, während das Solo-Instrument seine Worte wiedergibt: «Es ist alles ganz eitel.»“ Bloch betont besonders den Pessimismus des Königs, obwohl er von „Prunk, Herrlichkeit, Reichtum, Macht, Frauen und allem, was ein Mann in dieser Welt begehren kann“ und der „barbarischen Färbung einer orientalischen Welt“ umgeben ist. Der rhapsodische Stil und die glänzende Instrumentierung mögen dem Werk zwar eine improvisatorische Atmosphäre verleihen, doch ist die ihm zugrundeliegende Struktur eine solide „dreiteilige“ Form (ABA) mit Einleitung und Coda. Die heroische Melodie, die vor und während der großen Orchesterhöhepunkte gegen Ende des ersten und dritten Teils von Schelomo erklingt, ist auf Motiven aufgebaut, die eine bemerkenswerte Ähnlichkeit zu denen in Tzur Yisroel („Felsen Israels“) haben, einem traditionellen Gesang, den Bloch von Reuben Rinder (1887–1966, Kantor am Tempel Emanu-El in San Francisco) gegen Ende der Zwanziger Jahre erhalten hatte, als er seinen Avodath Hakodesh („Heiliger Gottesdienst“, 1930–33) vorbereitete. Obwohl mehrere Motive in den sechs veröffentlichten Werken des „Jewish Cycle“ von dem Komponisten unbewusst abgewandelte Versionen biblischer und kantorialer Gesänge sind, bestätigte Bloch in nur einem Fall, dass er die Melodie einer traditionellen Quelle entnommen habe—ein Motiv, welches sein Vater „oft auf Hebräisch gesungen“ hatte und das erstmals zu Beginn des Mittelteils von Schelomo erscheint. Vier Jahre nach Vollendung des Stücks zitierte Bloch den hebräischen Text in einem Brief an seine Mutter; bei der Melodie handelt es sich tatsächlich um eine Bearbeitung eines süddeutschen kantorialen Gesangs, Uv’chen ten pachdecha, der an Hohen Feiertagen in aschkenasischen Synagogen gesungen wurde. Obwohl das Werk für den Solisten technisch ungeheuer anspruchsvoll ist, handelt es sich hierbei nicht um ein Konzert im normalen Sinne, und die Virtuosität ist stets der Expressivität untergeordnet, in der sich das Spirituelle und Sinnliche vereinen. Das Werk war ursprünglich für Klavier angelegt—und tatsächlich gibt es eine separate Version für Klavier solo mit dem Titel Visions et Prophéties (mit fünf von den sechs Sätzen), die Bloch später komponierte. Doch zunächst sang der Komponist stets verschiedene Kontrapunkte, wenn er das Werk durchspielte. Zwar war sein Gesundheitszustand zu der Zeit nicht gut, doch gab er die Arbeit an dem Werk nicht auf und fügte noch eine Cellostimme hinzu. Als Alexandre Barjansky ihn im Juni 1935 in Paris besuchte (wo er vorübergehend wohnte), spielten die beiden Musiker Auszüge aus dem noch unvollendeten Werk Edmond Fleg (1874–1963) vor—dem Librettisten von Blochs Opern Macbeth und Jézabel sowie drei Psalmvertonungen. Die Reaktion darauf war überaus begeistert, was Bloch wiederum dazu ermunterte, die Version für Cello und Klavier (Mitte August 1935) und dann die Version für Cello und Orchester (Ende Januar 1936) fertigzustellen. Es war jedoch ein mühsamer Prozess, einen passenden Titel für das Werk zu finden. Bloch hatte seinem Freund Carl Engel eine detaillierte Analyse seiner Komposition zusammen mit Hinweisen auf Schwankungen in Stimmung und Atmosphäre innerhalb der einzelnen Sätze geschickt. Engel erinnerte sich später, dass er bei einem darauffolgenden Besuch bei Bloch (der inzwischen in Châtel in der Haute-Savoie lebte) von der religiösen Leidenschaft und prophetischen Eloquenz von Blochs Ausführung des Werks am Klavier zutiefst ergriffen war; das Bild der „Stimme in der Wildnis“ kam ihm spontan in den Sinn. Ohne zu zögern schrieb der Komponist diese Worte auf die erste Seite seines Manuskripts, da dieser Titel für ihn die Reise der Seele durch das ganze Spektrum der Lebenserfahrung geradezu perfekt wiedergab. Die sechs kurzen Sätze haben im Prinzip alle dieselbe zweiteilige Struktur: im ersten Teil, wo nur das Orchester erklingt, wird das thematische Material vorgestellt und im zweiten Teil setzt das Cello ein, wird vom Orchester begleitet und bezieht sich dann sowohl melodisch als auch rhythmisch auf die Stimmung und den Ethos des Vorangegangenen. Jegliche Beschreibungen von „Stimmung“ sind zwangsläufig subjektiv, insbesondere weil Bloch kein bestimmtes „Programm“ per se beabsichtigte. Doch die folgenden Kennzeichen geben vielleicht einen allgemeinen Eindruck der emotionalen Welt, die in jedem Satz dargestellt wird. Im ersten wird eine ernsthafte und feierliche Empfindung ausgedrückt und im zweiten zeigen sich Anklänge der Verbitterung. Der dritte Satz ist eher energisch und extravertiert gehalten, während der vierte sich in eine idyllische, traumhafte Dimension begibt. Der fünfte, ebenso wie der dritte, ist eher lebhaft und kraftvoll und endet mit einer leidenschaftlichen und äußerst chromatischen Kadenz für Solocello. Der sechste Satz ist der längste von allen und strahlt Freude, Zuversicht, Hoffnung und „den Sieg des Geistes“ aus und endet mit einer diatonischen Melodie, die Reinigung und Frieden auszudrücken scheint. Alle Sätze folgen direkt aufeinander—mit Ausnahme der kurzen Pause zwischen den letzten beiden Sätzen. Durch diese „zyklische“ Form wird eine Einheitlichkeit gewährleistet, wobei Themen aus früheren Sätzen wiederkehren, manchmal in identischer Form und zuweilen auch in unterschiedlicher Gestalt. Es ist dies ein Charakteristikum vieler Werke Blochs. Obwohl hier keine bewussten Zitate aus dem traditionellen melodischen Repertoire vorliegen, sind die akustischen Fingerabdrücke von Blochs „jüdischem“ Stil doch allgegenwärtig: das Verwenden von traditionellen modalen Klängen Mitteleuropas und der Aschkenasen im Allgemeinen sowie das häufige Auftreten der übermäßigen Sekunde (oft mit Halbtönen davor und danach) im Einzelnen; leere Quart- oder Quintparallelen; punktierte „Scotch Snap“-Rhythmen; häufige Tempo- und Metrumswechsel; dynamische Extreme; lebendige Kontraste zwischen Intensität und Ruhe—manchmal allmählich, manchmal abrupt. Musikalische Parallelen zu früheren Kompositionen wie etwa den Trois Poèmes juifs (1913), den drei Psalmen, 137, 114, 22 (1912–14), der Israel Symphony (1915–16), Schelomo (1916), dem Streichquartett Nr. 1 (1916), der Baal-Shem-Suite (1923) und des „Heiliger Gottesdienst“ (1930–33)—ebenso wie Vorwegnahmen späterer Werke wie etwa dem Violinkonzert (1938) und der Suite hébraïque (1951)—finden sich hier in Hülle und Fülle. Max Bruchs Werk Kol Nidrei, op. 47, entstand 1881 in Berlin und ist dem Cellisten Robert Hausmann (1852–1909) gewidmet. Es besteht aus zwei völlig eigenständigen musikalischen Einheiten. Dem ersten Teil liegt ein deutscher Synagogengesang zugrunde, der wahrscheinlich aus dem frühen 16. Jahrhundert stammt und seitdem allgemein als die aschkenasische Vertonung dieses aramäischen Texts aus dem 11. Jahrhundert anerkannt ist. Als er in Berlin lebte, war Bruch durch den Kantor Abraham Lichtenstein (1806–1880) mit einer der zahlreichen Varianten dieser Melodie in Kontakt gekommen, die deutliche Ähnlichkeit mit der Melodie hat, die Louis Lewandowski (1821–1894) in seinen beiden Synagogen-Anthologien aufgeführt hatte: Kol Rinnah U’t’fillah und Todah W’simrah. Der zweite Teil basiert auf dem Mittelteil des Lieds „O weep for those that wept by Babel’s stream“ (eine Paraphrase von Psalm 137) von dem anglo-jüdischen Komponisten Isaac Nathan (1790–1864), eine von über 30 Textvertonungen der Hebrew Melodies von Lord Byron (1788–1824) aus den Jahren 1815–16. Die intensive Dramatik des ersten Teils von Bruchs Kol Nidrei steht in Moll und wird durch die übergreifende Lyrik des zweiten Teils in Dur ausbalanciert. Der Komponist spekulierte, ob wohl die enorme Popularität dieses Werks der Grund für die verbreitete Annahme sei, dass er jüdischer Herkunft sei. Sein ältester bekannter Vorfahre war jedoch Thomas Bruch (geboren im Jahre 1560)—der erste in einer langen Reihe von christlichen Klerikern. Die Leidenschaft des „Cellisten als Kantor“, der eine Melodie spielt, die im Laufe der Jahrhunderte ikonenhaft geworden ist, erzeugt eine Stimmung religiöser Hingabe bei denjenigen, die die Musik als tief-liturgischen Ausdruck empfinden. Für diejenigen, die von der Schönheit weltlicher Kunstmusik inspiriert sind, entsteht eine Atmosphäre tiefer Meditation und Ruhe. I do not propose or desire to attempt a reconstruction of the music of Jewish music … or to base my work on melodies more or less authentic. I am not an archaeologist. I believe that the most important thing is to write good and sincere music—my music. It is rather the Hebrew spirit that interests me, the complex, ardent, agitated soul that vibrates for me in the Bible. The vigor … of the Patriarchs, the violence … in the books of the Prophets, the burning love of justice … the sorrow and the grandeur of the Book of Job, the sensuality of the Song of Songs. All this is in us, all this is in me, and it is the better part of me. Je n’entends pas, ni ne désire tenter de reconstruire la musique de la musique juive … ni fonder mon œuvre sur des mélodies plus ou moins authentiques. Je ne suis pas archéologue. Je crois que le plus important est d’écrire une musique belle et sincère—ma musique. C’est plutôt l’esprit hébreu qui m’intéresse, l’âme agitée complexe, ardente, qui, pour moi, vibre dans la Bible. La vigueur … des Patriarches, la violence … dans les livres des Prophètes, le brûlant amour de la justice … la tristesse et la grandeur du Livre de Job, la sensualité du Cantique des cantiques. Tout cela est en nous, tout cela est en moi, et c’est la meilleure part de moi. Weder schlage ich vor noch wünsche ich einen Rekonstruktionsversuch jüdischer Musik … ebenso wenig lege ich meinem Werk mehr oder minder authentische Melodien zugrunde. Ich bin kein Archäologe. Ich glaube, dass es das Wichtigste ist, gute und aufrichtige Musik zu schreiben—meine Musik. Es ist eher der hebräische Geist, der mich interessiert, die komplexe, leidenschaftliche und bewegte Seele, die für mich in der Bibel vibriert. Die Energie … der Erzväter, die Gewalt … in den Prophetenbüchern, die brennende Liebe der Gerechtigkeit … die Trauer und die Erhabenheit des Buchs Hiob, die Sinnlichkeit des Hohelieds. All dies ist in uns, all dies ist in mir, und es ist der bessere Teil von mir.